Last summer, X-Men: First Class all but made up for the failures of the previous two movies in the franchise. The prequel was shockingly good, and now the sequel to the prequel is in the works. In an interview with Simon Kinberg, screenwriter of both films, it was revealed that this sequel will focus heavily on Magneto’s storyline and Magneto’s growth as a character into a villain. The pilot for Arrow is coming along, and thanks to Stephen Amell, who was cast as Green Arrow, we have some insight into the process. Amell keeps a video blog on his Facebook where he answers fan questions. In the last video, he revealed several of the changes he has had to make in training for the part. He also said there is one more major character left to be cast that he knows of. 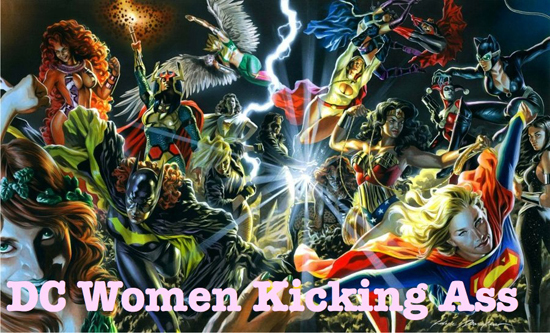 Last week, I reported about a comic documentary focusing on female super heroes that was seeking funding. Now, the first trailer for that film, WONDER WOMEN! The Untold Story of American Superheroines, is available. The film will make its debut at SXSW. In a recent interview with Kotaku, Geoff Johns announced DC is working on a Suicide Squad video game. Amongst all of DC’s game projects, John’s is particularly excited about this game because it will present a new conundrum where lead characters can be killed off for real, and it’s not a gimmick. For those not familiar with the Suicide Squad comic, it features prominent DC villains working on government espionage missions, and it is common to see main characters die off each issue. 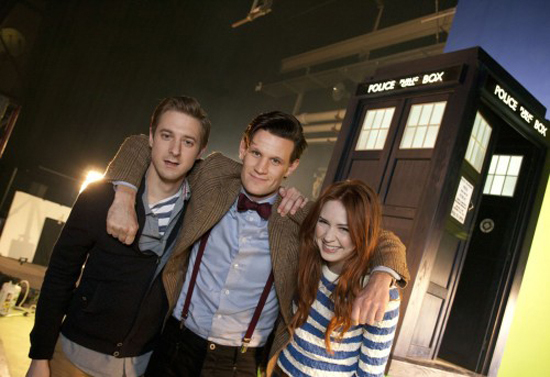 Doctor Who season seven has begun filming. The first stills from the set have hit the internet. Two more actors have also signed on for the run, Mark Williams (Inspector Lestrade in Sherlock) and David Bradley (Argus Filch from Harry Potter). Fear not Community fans. Show creator, Dan Harmon, tweeted the show will be returning on March 15th. Community will be back on Thursday nights at 8 PM. Let’s just hope it doesn’t go off air again, it’s was starting to feel like another Arrested Development scenario for a moment. Amongst vampire and werewolf killing presidents, another historical fiction story has been optioned by Hollywood. I Killed Adolf Hitler has been picked up by Studio Eight. The Eisner Award winning graphic novel follows the adventures of a hitman and his complications with travelling back in time to kill Hitler. Netflix has pulled another one over on cable and premium television. The Weinstein Company announced a deal that will make its movie releases exclusive to Netflix members. The studio has become well known for its production of Oscar award winning movies. Those same movies will be joining the internet revolution. The New York Toy Fair 2012 is wrapping up today, but this year’s collection makes me envy the kids who will be getting these toys for Christmas next year. Nerdy toys galore were shown off, including but not limited to: Ghost Busters statues, Portal 2 toys (including portal gun), The Dark Knight Rises action figures, Marvel and DC superhero collectibles, and so much more. The Toy Fair ends on a high note, hosting the largest toy bank of the year. 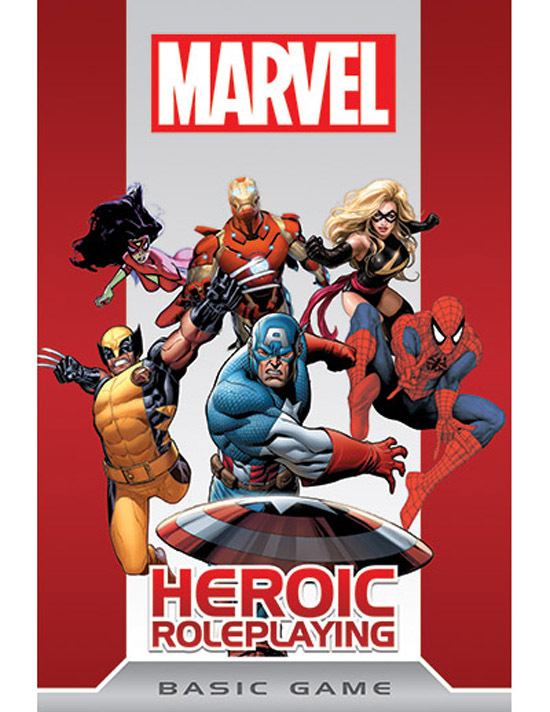 While we’re talking about toys, Marvel Heroic Roleplaying releases February 28. This new Marvel game means that role-players everywhere can stop converting to D20 Modern or other systems just to play a Marvel themed campaign. The game promises to be better than the previous half-assed Marvel RPGs that have been released. 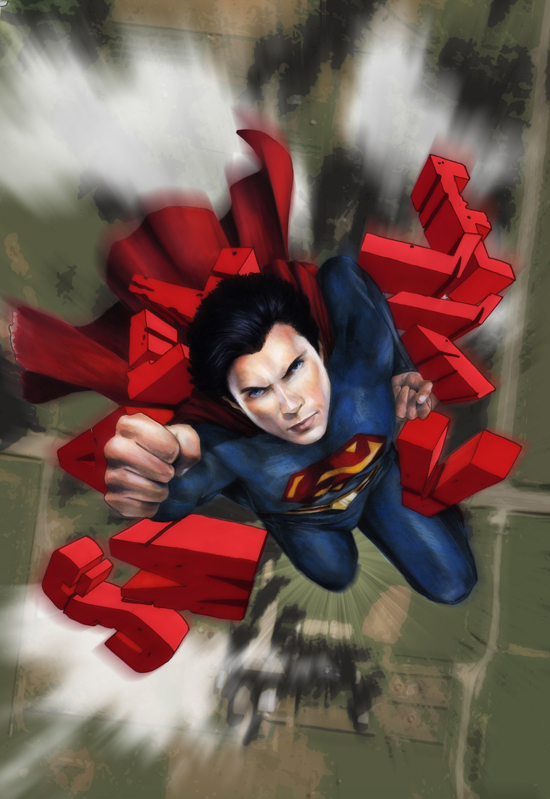 It uses the Cortex Plus rules set made famous in the Leverage and Smallville RPGs. The basic game releases at the end of the month, but several expansions such as Civil War are planned as early as March 2012. We’ve heard many rumors of a Smallville continuation. Everything from another season of the television show to a novel has been alleged. Last Thursday, DC comics gave us the official scoop, announcing the official Smallville Season 11 comic series. The comics pick up where the show left off, and we can expect to see several of our favorites return including Green Arrow and Chloe Sullivan-Queen. Marvel has given us a teaser of the first showdown from Avengers VS X-Men. 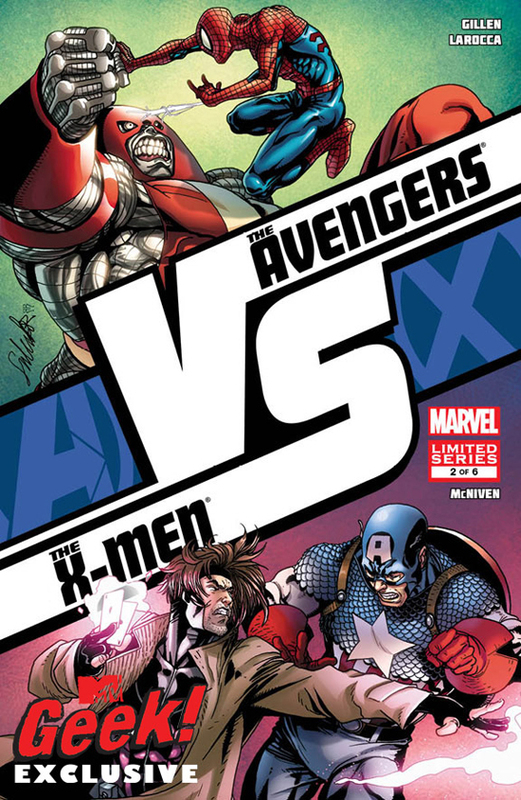 The second comic’s cover features Gambit going head-to-head with Captain America and Spider-Man fighting Colossus. It looks like Marvel is determined to give us showdowns never seen before. All of the comic news from the big boys is great, but it pales in comparison to the awesomeness announced by IDW comics. 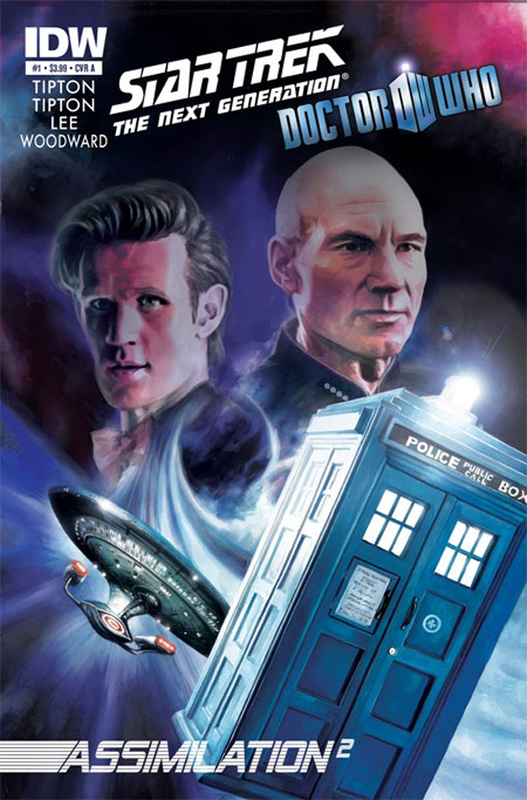 In possibly the most epic crossover ever, Dr. Who and Star Trek: The Next Generation will come together in a new comic. The Dr. and his gang will join the crew of the Enterprise for what’s bound to be a great adventure. We should know more when it is officially announced this week at the Gallifrey One convention in the UK. Do you want to see a comic documentary with a focus on the rise of women in comics? If so, a Kickstarter account has been opened to fund such a film. The documentary, Wonder Woman! The Untold Story of American Superheroines is seeking the funding to debut at South by Southwest this March. If you are sick of all the male-centric comic documentaries focusing on Superman and Captain America, this is your chance to help get this movie off the ground. Moving out of comics and into the movie world, the first preview for the Tim Burton produced Abraham Lincoln: Vampire Hunter has arrived. The movie drops into theaters on June 22. There is a new live action Teenage Mutant Ninja Turtles in the works, and it looks like they’ve found a director – Jonathan Liebesman, who helmed Battle: Los Angeles and the upcoming Wrath of the Titans. We’ve known about the inevitable Transformers 4, but I don’t think anyone was expecting Michael Bay would use it to reboot the series. It’s official now since the producers are tossing around the word reboot, but I don’t know if they’re using it correctly. Producer Lorenzo di Bonavantura tried to correlate Transformers 4 to Amazing Spider-Man, but really only ended up saying they weren’t doing a full reboot. I’m not sure what their definition of the term is – it could be anything. A new storyline? A new cast? New Transformers? It’s all up in the air, but the fourth movie is aiming to release June 29, 2014. Ghost Rider: Spirit of Vengeance releases in a few days, and now co-director Brain Taylor is onto his next project. He just happens to be writing and directing a live action movie based on the totally rockin’ Playstation demolition derby Twisted Metal game. That’s right Sweet Tooth and other favorites such as Doll Face will be appearing on the silver screen. Who needs an army when you have a Hulk on your side? The newest trailer for The Avengers aired this weekend as part of the Super Bowl ad lineup. The Avengers will be released this May and each trailer just makes it looks better and better. Amazing Spider-Man also released its second trailer this last week. After the CGI wreck they released first time around, this second one was a pleasant surprise. A new trailer wasn’t the only thing to come forth from the Amazing Spider-Man camp, more photos and characters bios were released on the official website. Spider-man is looking up, but I still don’t know if it will be able to stand against The Avengers or The Dark Knight Rises. It’s starting to look like Hollywood is going to be packed with superheroes in the summer of 2013 as well. The Wolverine has a July 26, 2013 release date, joining The Man of Steel, Iron Man 3, and Thor 2 for the 2013 summer superhero season. Now, I love my superhero movies, but if Hollywood keeps putting them out at this frequency they are going to burn us all out. I personally have tired of the old X-Men series since the third movie bombed. The big event happening over at Marvel Comics this year is Avengers vs. X-Men, but there is one other major happening — Spider-Men. Not much was known about this till the last week when Marvel released a graphic of two Spider-Man logos meshed together. It is clear the logos are that of Peter Parker and Miles Morales. Most are complaining, assuming they are bringing back Peter Parker in the Ultimates universe that Miles Morales now acts as Spider-Man in. I would like to raise a new theory however, they are introducing Miles Morales into the main Marvel line, or Earth-616. As the Ultimates universe is a variation of their main verse (the one Amazing Spider-Man takes place in), I argue that Miles Morales could exist in that world to. If he became a Spider-Man there, we would then have three Spider-Men, including the new Scarlet Spider. That puts Marvel half way to creating some Spider-Man knockoff of Batman Incorporated. Marvel’s Spider-Men logo was small news compared to DC officially announcement of Before Watchmen. The series will star the Watchmen heroes in events that happen before the graphic novel Watchmen. There will be seven books total: Rorschach, Minutemen, Comedian, Dr. Manhatten, Nite Owl, Ozymandias, and Silk Spectre. Each issue will also feature a two page back up story of Curse of the Crimson Corsair. There has been a lot of talk about the whether or not DC should publish these comics. Allen Moore, the creator of Watchmen, had a falling out with DC and does not want them to use his properties. However, from a legal standpoint DC have retained the rights. After losing their first choice for the female lead, the Evil Dead remake has cast Jane Levy (pictured in our header) to fill the role. Levy will be playing Mia, the equivalent of Bruce Campbell’s Ash Williams. Hopefully this casting sticks as they only have about a year left since the film releases on April 12, 2013. Despite the a low domestic gross total, Robert Rodriguez intends to make good on his promise to make two more Machete films. That dream is coming even closer as he has teamed up with producer Alexander Rodnyansky to begin work on the second film in the trilogy. Despite its low gross totals, the first film was a cult success and it almost doubled its cheap budget. Many a rumor about the upcoming The Avengers film has been laid to rest. On January 31, the official Avengers Twitter had a chat with fans answering the most pressing questions. For a portion of the chat, Joss Whedon was on hand and the ‘For JW’ tag started trending. One of the rumors squashed was talk of an Amazing Spider-Man cameo. Whedon personally put this rumor down. More information has come out about Arrow, the Green Arrow pilot in production by the CW. Instead of tying the show back to Smallville and trying to capture that audience, they have really reworked the Green Arrow’s story. Oliver Queen’s mother is still alive and he will have a little sister that seems to be a catalyst for most of the trouble he has to stop. Some DC characters will show up, such as Black Canary, but they will not play their superhero roles, at least not as of yet. The part of Oliver Queen aka the Green Arrow has been given to Stephen Amell. Marvel’s major comic event this year, Avengers VS. X-Men will be starting this March. Marvel has released a sneak preview of the Avengers VS. X-Men #0 where all the problems will start. 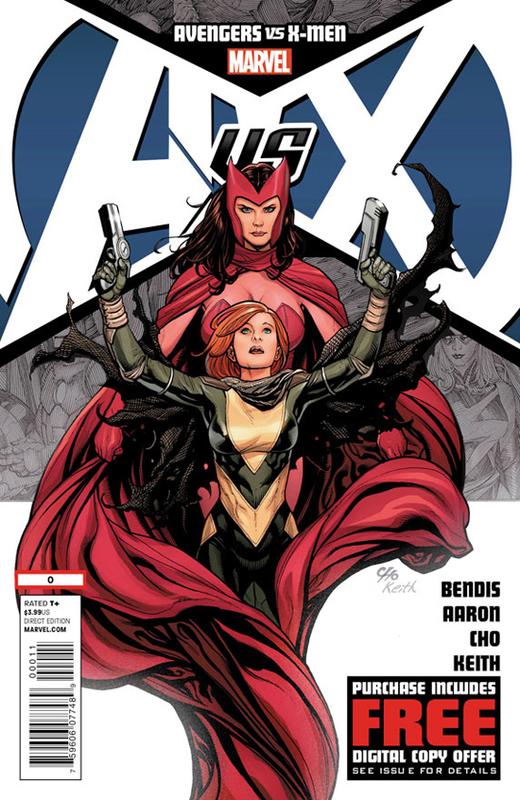 This first issue sets up the crucial roles of Scarlet Witch and Hope Summers. The two most powerful ladies in the Marvel universe will be going head-to-head, each with a super powered team to back them. Speaking of new comics, IDW Publishing, will be starting a Dungeons & Dragons: Forgotten Realms comic series. D&D fans have a chance to have their characters featured in the comics. You can find all the rules for the character creation contest here. One of the biggest names in comics, Stan Lee, is launching his own website. You can sign up for updates from the site and a chance to win autographed merchandise right now, but the full site won’t launch till February 8. On top of contests and games, the sites main function will be behind-the-scenes looks into Stan’s new projects. Zoe Saldana talked Star Trek 2 in a recent interview. While she couldn’t say much, she all but told us that there is more to come between Spock and Uhura. Star Trek writer Robert Orci also came out with a few comments, these ones directed at fans. In a fan driven industry like Star Trek, the fans are the best and worst part of it, and Orci has had enough of them second guessing him. In short, Orci pointed out that they did well with the first remake and that success has earned them a lot of leeway with the studio. He doesn’t promise the movie will be good, but he does promise it will be exactly what they want it to be. On a final note, you can stop holding your breath waiting for Blizz Con 2012 to be announced, it’s not happening. Blizzard Entertainment would rather focus on releasing Diablo 3, Heart of the Swarm and Mists of Pandaria than wasting their time organizing another convention. This doesn’t mean they don’t love their fans and the convention will be back in 2013. As someone who has personally attended multiple Blizz Cons, they should take a break. Doing it yearly means they never have enough new news to justify bringing out thousands of fans from around the world. Hopefully, this way they will have something substantial to show us next time. As we get closer to the release of The Dark Knight Rises, we’re finally establishing the truth behind many of the numerous past rumors that have surrounded the project throughout production. Liam Neeson has put another one to rest when he confirmed he will reprise his role as Ra’s al Ghul in the film. Neeson couldn’t say much more about the project, because apparently his part is so small that he didn’t get much access. The Dark Knight Rises hits theaters July 20, and a line of figurines are already being prepped to hit the market. These twelve inch models do an amazing job of capturing the outfits from the upcoming film and will be on sale in June. The Deadpool movie is going into production this year. The ‘merc with a mouth’ will be getting his own film, and Rob Liefeld has seen eight minutes of the test footage. Ryan Reynolds is returning as Deadpool. Now we can only hope the film does the character more justice than Wolverine Origins did. New high resolution images of The Avengers have been released. We’ve seen similar shots before, but we do get decent ones of each main character — sorry Hawk Eye didn’t make the cut. The only big thing of note here is we get some of the first clear shots of the Hulk. Some lucky little fan got to take a photo with Superman and the picture has made its way online. The shot from the set of Man of Steel gives a clear look at the new Superman suit. Not to mention it really makes Henry Cavill look the part of Superman. Last week, DC Comics logo change made its way around the web. Everyone, including myself, criticized the look of the new logo. DC has since revealed how they plan to use the logo. In a rather interesting twist, the logo was designed so it could be customized. Each logo keeps the same basic style, but changes its color and look depending on the comic it appears on. Despite my comments last week, I have to say this is pretty cool. 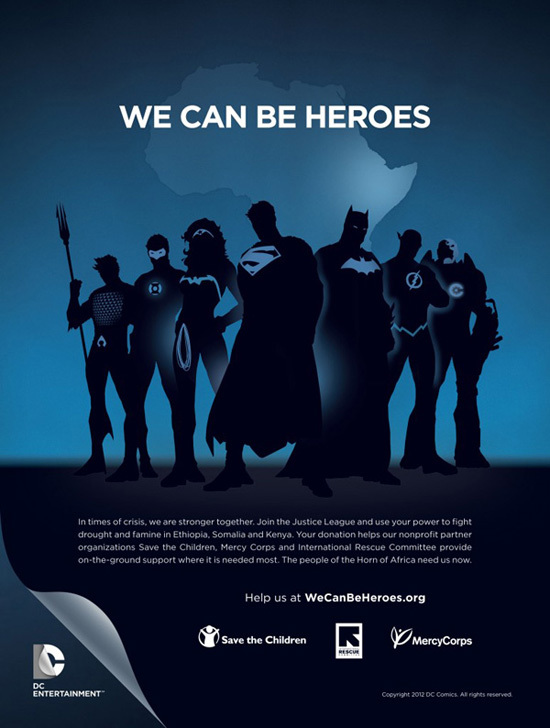 One other big story coming from DC Entertainment, the company announced a multi-million dollar campaign to raise money to fight hunger in the Horn of Africa. The campaign is called We Can Be Heroes. Using the Justice League of America as mascots, DC hopes to inspire the hero in everyone to end this crisis. A few weeks back, Lily Collins was announced as the main character in the upcoming Evil Dead remake. However, due to scheduling conflicts, she has had to give up the part. There is still no news on who is going to take over the role, but time is running out as the film is scheduled in theaters April 12, 2013. The first trailer for Doctor Who: The Eternity Clock videogame has been released. It’s set to release on the PS3, PS Vita, and PC later this year. Speaking of Doctor Who…the show’s producer and chief screenwriter Russel T. Davies (who was also responsible for spin-off show Torchwood), has created a new series for BBC Wales. Aliens vs. Wizards is a 26-part series aimed at a younger audience. It’s about a young wizard, Tom Clarke, and his struggle against the aggressive aliens, the Nekross. While the show is being made for children, that doesn’t mean Doctor Who fans shouldn’t give it a shot. On a final note, Cryptic Studios has made Star Trek Online free to play. The game is now free through the silver membership, which gives full game access but limited community access. There is still a gold membership with full access for $15 a month. Since being elected president in 2000 (look it up if you don’t remember), Al Gore has forged a career as a public speaker. The movie of his speech about the climate crisis, An Inconvenient Truth, won an Oscar for best documentary. The former vice president also serves as the chairman of Current TV, a next generation news service he cofounded. The cable network features political programming with hosts like Cenk Uygur and Jennifer Granholm. It offers an alternative to the ultra right wing Fox News, and serves as a breath of fresh air when compared to the staid but supposedly balanced CNN. Gore presented the network’s latest programming, anticipating the 2012 election cycle, to the Television Critics Association on Jan. 13. The critics must have reminded Gore of his days facing the White House press corps. We get the scoop on Snooki, so we’re not letting any fancy guys in suits get off easy. Perhaps Gore is still a politician at heart. He took questions from critics but you might say he was filibustering to keep the conversation revolving around his talking points. Yes, he brought up the climate crisis on his own. Check your cable listings for Current TV and below for Gore’s thoughts on news coverage, Occupy Wall Street and the upcoming election. Read SuicideGirls’ interview with Al Gore on SuicideGirls.com. Did you watch Ink Masters last night? If not you can watch the whole episode here! I think a reality competition show about tattoo artists is a super cool idea. Basically the same format as Top Chef or Project Runway (which I am addicted to) but with WAY higher stakes. Listening to Ink Master judge Oliver Peck‘s critiques on line work and shading was super interesting. That type of knowledge of what to look for in a tattoo artist will make for a more well informed public. I think the time limit to do the tattoos is a bit scary since they have to be on someone’s body forever but I guess a good tattoo artist can budget their time accordingly. Some of the artists seem like they might need some more experience before they will get everything down perfectly though. Which is a little scary to watch and you feel for the human canvases, well most of them. Anything the contestants do though will likely be better than what the people might get from walking into the nearest open shop without a plan. It is always nice to see our friend Dave Navarro too.